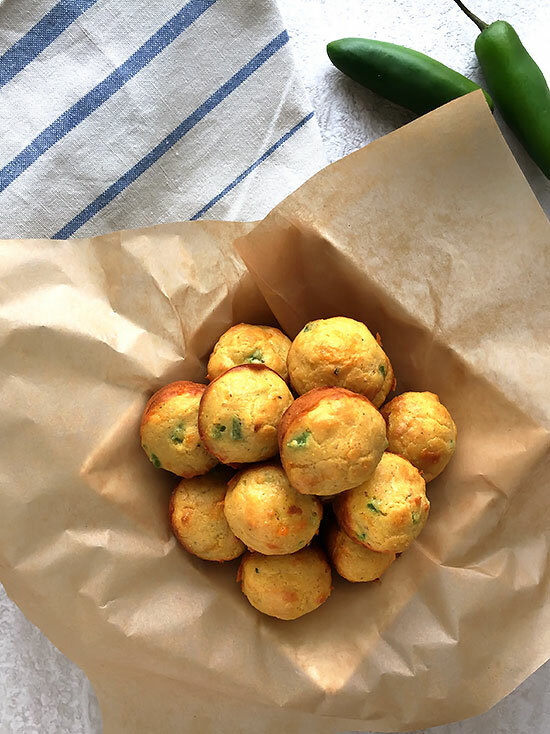 How cute are these mini Jalapeño Cheddar Einkorn Cornbread Muffins?! Funny thing is, I was actually trying out a test recipe for baked hushpuppies. I had found a recipe for them on the Food Network, so I used that as sort of a guide for my own. Obviously, they don’t really resemble hushpuppies, but they ARE baked and not fried. You aren’t going to get the exact same crispy deliciousness without frying them. 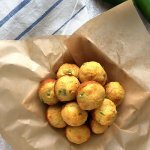 My husband said they were very tasty, but more like cornbread than hushpuppies. I had to agree. So, despite the fact that they aren’t what I set out to create, they are still very yummy! In about twenty minutes, you can have these on your dinner table. I think that both kids and adults alike will really enjoy these littles bites. You guys know I’m a huge fan of cornbread, and these mini cornbread muffins are just a new fun way to enjoy it! Preheat the oven to 450° F. Lightly grease a 24-cup mini muffin pan with the softened butter. In a medium-sized bowl, whisk together the cornmeal, flour, baking powder and salt. Add the shredded cheese and whisk into the mixture. In a small bowl whisk together the eggs, milk, melted butter and jalapeño. Fold the wet ingredients into the dry mixture until just combined. Evenly distribute the mixture among the 24 muffin cups. It's about a tablespoon per cup. Place into oven and bake until they are firm to the touch and golden brown around the edges, about 10 minutes. Can I get one or two of these muffins? Yummy!